When I order my 32 oz. iced tea every morning, most of the baristas call it an extra large, as do I. Calvin refers to my tea as a “super size!” So much better! Calvin brings his unique personality and award-winning smile to work with him every day, as the head roaster and occasional barista at Quartermaine Coffee Roasters. 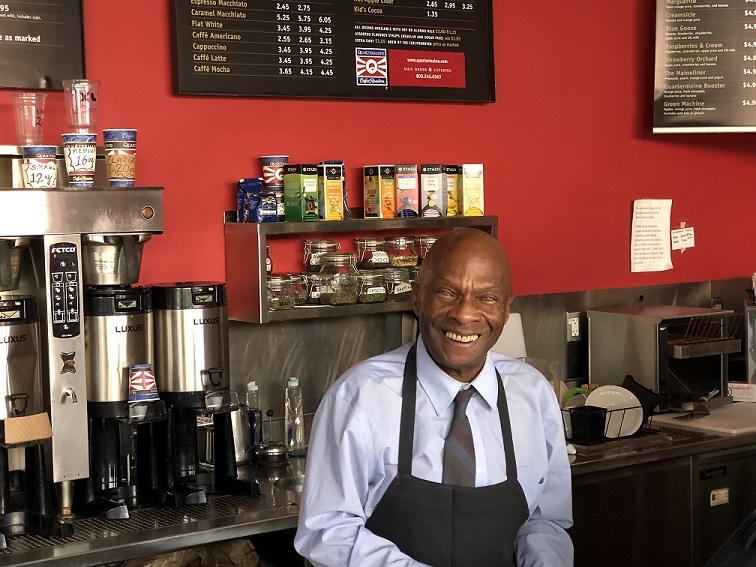 Calvin has worked at Quartermaine for almost 21 years, and I’ve gotten to know him through snippets of conversation while ordering my iced tea, or during short bursts of discussion when I’ve stayed to do some work. Calvin was born at Freedmen’s Hospital in DC, so named because it was originally founded to care for former slaves. Eventually, Freedmen’s Hospital became part of Howard University. As he notes in his Three For Thursday, Calvin has three children and ten grandchildren. They range in age from six to twenty. His family is spread between Georgia, DC, and Pittsburgh. Calvin’s Three For Thursday follow. Life is such a strange, but understandable, journey. The way I see it, all of the positives and negatives surround and encompass us. From the smallest to the largest. From sub-atomic particles to universal galactic stellar neighborhoods. To me, life and everything that it has to offer are like music…energy and vibrations. Universal rhythms. Life, like music, is amazing and is to be embraced. I cannot say enough about my family! I figure it goes back to the energy (from our ancestors) and the good vibrations that have been and continue to be shared amongst all of us. My immediate family? Thank you Linda and thank you Stephanie (R.I.P. ), the two wonderful women without whom I could not speak of my three children and ten grandchildren. Having grandchildren is like having reflecting mirrors that go on and on! I watch in wonder as they grow and make us all proud! Science might be the most crowning glory of human achievement. In this world of “this against that” and “those against them”, on this topsy-turvy planet on the brink of dramatic, drastic environmental change, on this place that we call home, why do 7.6 x 109 people act like they hate each other for the most insane reasons? Learn and teach the sciences. The road ahead will be a wondrous one. The knowledge that comes from science can help to eradicate hate. Love. It’s so darn simple. Love conquers hate and it always will. When you greet the world through loving eyes, it’s a wonderful place!